Nach: Honestly this was an idea that came to me when I suggested Dam to play the game, back when I was a wee boy I did the same with a couple of friends, they saw the game and mocked me for playing a "mediocre" game, years later they gave it a try and nowadays most of our conversations include a moment from this game. Earthbound it's a game that doesn't take itself too seriously, except when it does it presents you a unique story filled with wonderful characters and music. 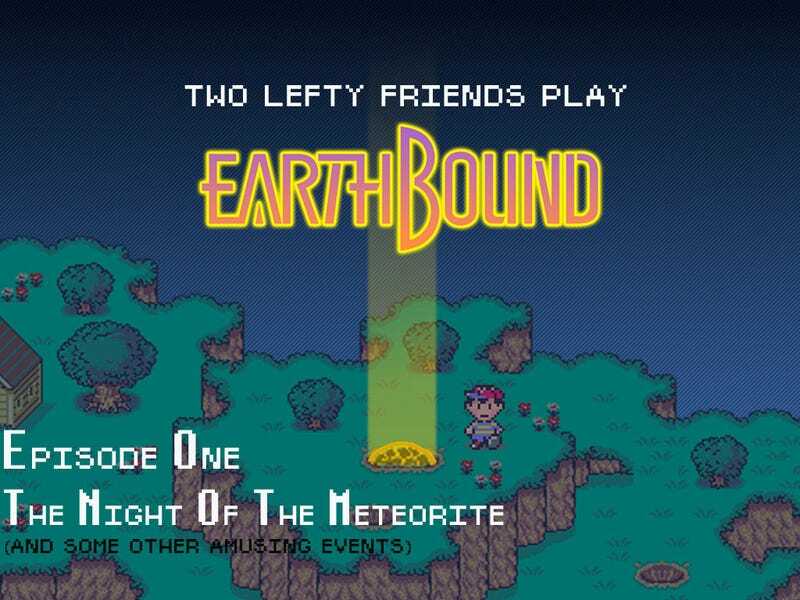 Hopefully through this episodic playthrough more people will join us as we trek into the bizarre mind of Shigesato Itoi! The one thing I know about Earthbound is that it is well-loved and a bit quirky. I found out within seconds that a bit quirky was an understatement. Who is Giygas? Why are there UFOs? And why are they destroying everything? Then you are taken to a screen where you make up names for not only your fellow characters, but for your dog as well. You're even asked to name your favorite food and favorite thing. It's sweet and interesting, but every once in a while there is a note that doesn't belong, or a background noise that is out of place. There seems to be carnival music that pops up every once in a while that doesn't mesh with the rest of the song. And it's here I noticed a clowny/carnival feel to certain things. Once you are finally in game, you start out as Ness, a cute, little 16-bit boy in pajamas. A meteorite has crashed near to his town of Onett, Eagleland. (I thought it was England, and while I have a feeling the game is modeled after England, it's not called that.) After the meteorite lands, you can hear sirens in the distance. It is something that pulls you into the game because of the realism. Ness, being curious and young, decides to go investigate. As he makes his way up to the crash site, he meets some of the locals, like Picky and Pokey, and the ever-road-closing Police of Onett. Eventually Ness realizes he can't get past the cops to the meteorite, so he gives up and goes home. Except later that night Pokey starts banging on the door and needs your help finding his brother Picky, who he lost around the meteorite. With Pokey and King (my dog's name), Ness starts his adventure. But wait! First he must save by calling his dad on the phone. (Poor Ash and Ness…missing father syndrome.) Once you save, then it's on to the adventure. It's now that enemies start appearing. They are all there on the map (Thank you Shigesato Itoi! ), waiting to be fought. And the enemies are all quirky too. There are Spiteful Crows, who try and steal food, and the Runaway Dogs, whose howls sometimes mess up King's attack. And speaking of attacking, Pokey never attacks. He'll hide behind Ness or apologize. And the funniest part is that it's all written, since you don't see your party's characters onscreen. After a few battles, Ness leveles up and learns something called Lifeup a, which is a PSI attack. PSI is like magic in most RPGs. And Lifeup is what it sounds like. It's a healing spell. As Ness approaches the meteorite, his faithful companion King hightails (Get it?) it out of there. Luckily Picky is nearby to join the party. And that's when things get even crazier. Pokey starts asking about hearing buzzing and suddenly a bee (not) named Buzz Buzz appears out of a great beam of light emanating from the meteorite. He tells you that he is from 10 years in the future, where Giygas reigns. He then starts speaking of a legend from where he is from, that tells of 3 boys and a girl that can stop Giygas. (All I can say is Pokey better not be one. And he seems to feel the same way.) Buzz Buzz, the fake bee who used to be something or someone else, joins the party and you all head back to Pokey and Picky's house. Along the way, a Starman Junion appears. He claims to be hunting Buzz x2 and attacks. This fight lets you know how far you have to go in the game. Buzz x2 is the only one that can really damage the Starman, and let us not forget the enemy is a Junior Starman. That means there are probably regular and senior Starmen out there waiting to destroy Ness. After the ragtag party wins the fight, Buzz x2 tells Ness that from now on he will be fighting Giygas' forces, humans with evil thoughts and animals that Giygas is affecting. So basically everything you can possibly think of. If plants get in on this poor Ness won't be able to move. Once he finally escapes the clown house, Ness heads off to his house to save and recover and sleep. In the morning, after having his picture taken by some strange man that makes him say "Fuzzy Pickles! 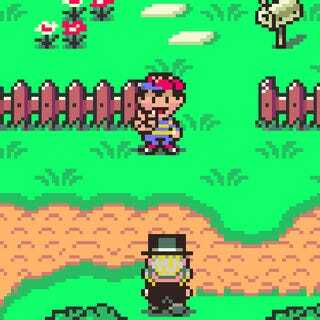 ", Ness goes off to explore the world around him. Actually, the roads are closed off (the Onett Police at their finest) or locked, but there is the town to finally explore. And what a town it is. There are drugstores with equipment and hotels to rest in. There is the Library and City Hall, both with very informative NPCs wandering their halls. There is even the arcade, where the local ruffians The Sharks have set up base. But what to do to get out of town after exploring? How to open one of the exits? Oh, that right, Ness has to beat up the leader of the Sharks, Frank. Ness and I enter the arcade to beat up Frank…and die…repeatedly. And this is when I (coughNachtellsmecough) realize that grinding levels will be important in Earthbound. I went grinding until I was at Level 8 and tired of the very few fights to get into. Off to the arcade we go again, and lo and behold, Frank (who humiliated me 5 or 6 times) falls under Ness' bat. And then that unassuming robot that happened to be near to Frank springs to life. The Frankiestein Mark II proceeds to pummel Ness, but with one last critical hit the robot falls. Actually Ness had nothing to do with it. Apparently the robot just fails at some point. Do I see a rematch in the future? The defeated and humiliated Frank informs Ness that to make it to Giant Step he must go to the Mayor and get the key. To City Hall Ness goes and receives (but not without a funny exchange of words with Mayor Pirkle!) said key and to Giant Step he marches. But that is where we must leave off this time. One, because I haven't conquered the Step and two, because this post is really long. Giant Ants, Battle Slugs and corrupted cops! - See ya Fuzzy Pickles!